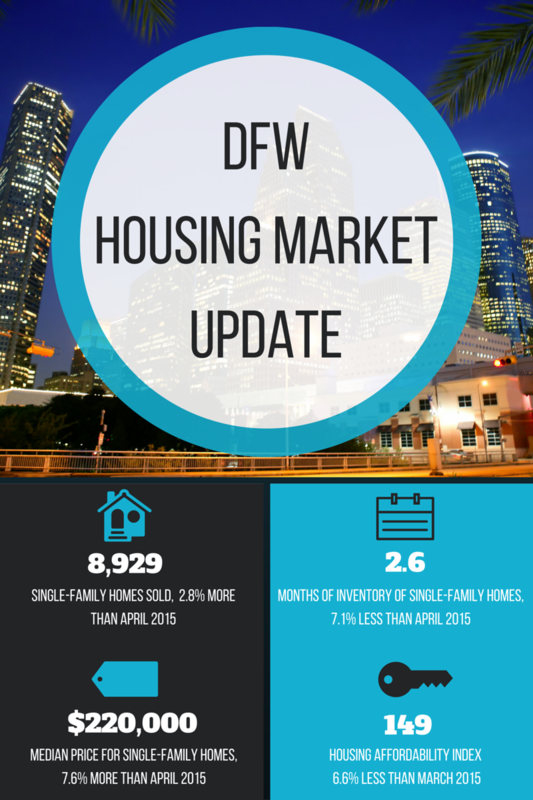 The Dallas/Fort Worth area is experiencing what can only be referred to as a seller’s market. While predictable, these numbers point to an overwhelming demand and little supply of homes on the market. For instance, North Texas Real Estate Information Systems (NTREIS) released its market data for April 2016 which shows a 3.1% drop in new listings (to 13,026) while the number of closed sales rose 2.8% to 8,929. The median sales price continues to rise steadily, up 7.6% in April 2016 to $220,000. This is largely due to the number of people moving to the area and the lack of space to fit them. Neighborhoods that are in high demand are growing up rather than out, and existing inventory is selling more quickly than ever. Homes that are priced well in the North Texas area are not lasting more than a few days on the market. Many sellers are receiving well over asking price, and multiple offers are commonplace. Areas like Downtown Dallas, Uptown, Oak Lawn, The M Streets, Bishop/Arts in Oak Cliff, and even staunch Lakewood are seeing high rise condos or mid-rise apartments filling in the gaps in the housing crunch. Inventory of homes dropped 2.2% to 23,007 homes, leaving us with 2.6 months supply of homes for sale. That’s a 7.1% decrease from the same time last year. This puts sellers at a distinct advantage, especially sellers in the most desirable areas of town. Sellers, on average, received 97.7% of their original list price, which is 0.3% more than the same time last year. What’s a buyer to do in a market so slanted in the seller’s favor? There are several things you can do to help you navigate a market as competitive as ours. Find a good real estate agent. In a market as hot as ours, it’s overwhelmingly important to hire an experienced Realtor®, preferably one with lots of connections. The idea is to hire someone who hears about listings as soon as they hit the market, or before. Many agents have access to exclusive listings from other agents at their company before they are officially listed on the MLS. We at HomeCity call these Coming Soon Listings or Pocket Listings. Hiring an agent with access to listings like these is extremely handy, and gives you a leg up on the competition. Some homes are sold in this way before they even hit the market. Get your financing in order. Talk to a lender before you even begin your home search to obtain a good faith estimate or pre-approval. This way you will have already compared interest rates, know about how much house you can realistically afford, and hopefully have an idea what your loan officer can do. Aim to work with an officer who has a good reputation in the industry for quick, smooth closings. Decide what you are willing to compromise on before you begin. Do your research before you begin your home search to figure out what you are willing to compromise on, and what you aren’t. In a market like ours, buyers won’t always have the luxury of thinking about their decisions for very long. Additionally, it’s important to know and have a Realtor® who knows what items are more cost effective to manage after the homes purchased and what is important to ask the seller to handle. Track Lighting and laminate floors, for instance, are items easily fixed by a knowledgeable contractor. These issues might send some of the competition heading for the hills, which is fine – more chance you’ll win the house! Offer incentives to sellers. When putting in an offer on the house in a competitive market, it’s best practice to offer incentives such as a quick closing, waiving the financing contingency (be careful with this one), covering closing costs, and offering a smooth transaction. Some potential buyers even like to include personal notes to the seller with their offer, letting the seller know why they love that home and how they plan to live in it. Tugging at the heart strings can sometimes work! Don’t give up. It’s inevitable that offers are going to get refused in such a competitive market, tenacious sellers are usually rewarded in the end. Don’t get discouraged if you don’t win the first house you like. There will be more, and possibly even better options that spring up! Be careful not to feel desperate if you happen to lose several bids, making an offer on a home you don’t love will leave you feeling resentful. The market doesn’t seem to be slowing down anytime soon, so implementing best practices will ensure a smooth and stress-free home search! Take advantage of our knowledgeable staff and ask a question below if you are curious. We’d love to help you out and know how we can better serve the buyers.